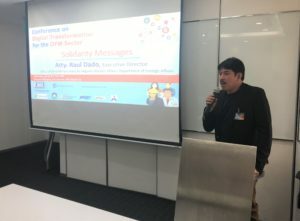 The Conference on Digital Transformation for the OFW Sector gathered representatives from both the government and private sector to share experiences on undergoing digital transformation. The sharing sought to inspire the Overseas Employment sector in embracing technology as a platform for closer ties with Filipinos abroad. It initiated partnerships between the government and private sector in adopting technologies that would improve services for OFWs and their families. 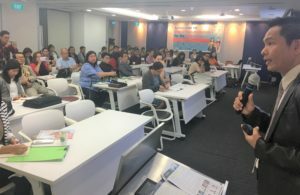 Fifty-five (55) representatives from the government agencies, private sector and industry leaders, civil society organizations, and Overseas Filipino Workers (OFWs) and families participated in the Conference. 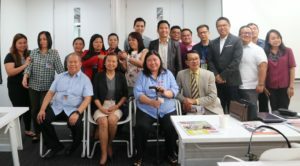 Pag- IBIG Fund, MMML Recruitment Services Inc., Japan Employment Providers of the Philippines and Consultancy Association (JEPPCA), Philippine Association of Service Exporters Inc. (PASEI), iRemit Inc., and the Development bank of the Philippines sponsored the event. 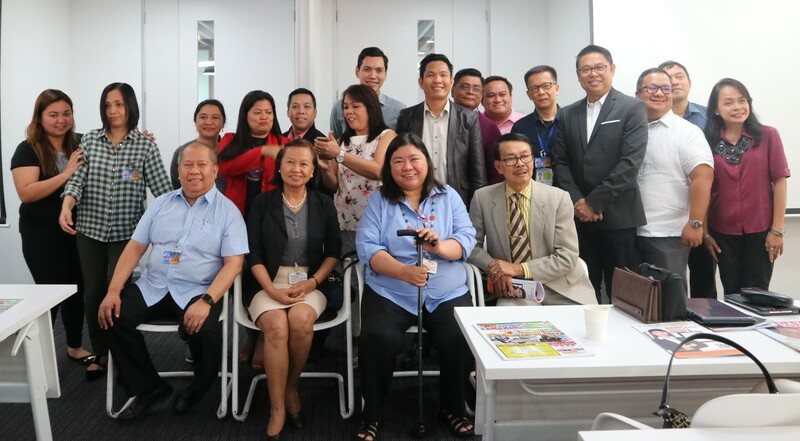 The Blas F. Ople Center invited IT and social media experts from the government and private sector to discuss the best practices, challenges, and gaps of their organizations in their digital transformation journey. The speakers discussed trends, issues, and opportunities in digital transformation, internet security, role of social media, and ICT plans and programs of the government. Private sector speakers also presented digital success stories. In her welcoming remarks, Ms. Susan Ople, President of the Blas F. Ople Center, said that digital transformation remains a challenge in the OFW sector. She said that other sectors are active in initiating ICT reforms in their organizations. The OFW sector is left behind because discussions about digital transformation rarely happen. Ms. Susan said there are organizations from the sector that began investing in technology but do not have the venue to share their experiences and expertise. She also acknowledged the ICT skills of our OFWs and ways they could contribute to improve the sector. According to Ms. Susan, this motivated the Ople Center to organize the event. She encouraged everyone to use this opportunity to produce a collective effort in beginning and sustaining ICT reforms in the OFW sector. Ms. Susan ended her speech by advising the participants to learn together, open their minds and actively engage in the discussions. ACTS- OFW Partylist Rep. John Bertiz, represented by Ms. Kaye Lapena, Ms. Elsa Villa from PASEI and Atty. Raul Dado from the Office of the Undersecretary for Migrant Workers Affairs (OUMWA) of the DFA delivered solidarity messages. Atty. Raul Dado agreed that the DFA should start taking advantage of ICT to improve service delivery. 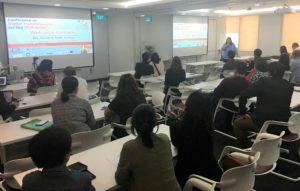 He shared that Foreign Affairs Secretary Alan Cayetano encouraged everyone in the department to increase and strengthen their presence in social media. Atty. Dado admitted that through Facebook, the OUMWA was able to reach out to OFWs, get to know their concerns and even save their lives. He said that Facebook opened their minds to the real conditions of our OFWs. In behalf of ACTS- OFW Partylist Rep. John Bertiz, Ms. Kaye shared how migration and the rapid increase in information technology are interconnected. She said that these advancements should be used to maximize the benefits and mitigate the social costs of migration. She cited how ICT could be used to protect our workers since most of the cases that they have received are through social media. Ms. Kaye also said that ACTS- OFW made it a priority to modernize the sector through several measures. Cong. Bertiz authored House Resolution 660 calling for an investigation on the implementation of the Shared Government Information System on Migration. She also shared that the ACTS- OFW Partylist has been working with the POEA and other government agencies for a single and integrated ID system for our OFWs. Ms. Kaye ended the speech by assuring the audience that Congressman Bertiz is in full support of the event and is willing to help in translating outputs into policies and concrete programs. Ms. Elsa Villa shared how PASEI maximized the potential of ICT. Through their own mobile application, the application process became easier and less costly for OFWs and potential employers. Another salient feature of the mobile app is its monitoring feature wherein it could verify the status of their deployed workers. Mr. Eufer Pasion of Microsoft Philippines opened the discussions by introducing internet security and gave out tips for online safety. According to him, the golden rule in the internet is to think before posting or sharing information online. He also emphasized the importance of reporting abuses or harassments done online. Mr. Eufer said that reporting online harassment to the authorities would mean that they could take significant measures to reduce casualties and eliminate these kinds of threats. Asec. Alan Silor of the DICT informed the participants on the ICT policies, plans and programs of the government. He said that the National Broadband Plan, National Government Portal and Free Access to Public Wifi (Pipol Konek) were the major ICT programs of the administration. 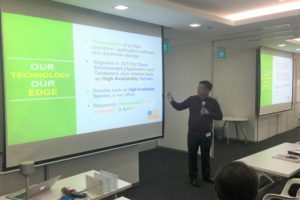 In his presentation, he also mentioned how the National Government Portal (NGP) would act as a one- stop shop of online services provided by the government. Once fully implemented and operational, our OFWs would be saved from going to several agencies to avail of their services or claim benefits. Asec. Silor also answered queries on budget and resources, on harmonizing all ICT- related activities of government agencies and provided ways to lessen the risks of cyber exploitation. Admin. Hans Cacdac shared the ICT initiatives of OWWA. He mentioned the improvement of the OWWA website, the creation of an OWWA mobile application and the increased presence of OWWA in Facebook. Admin. Hans said that OWWA has been doubling its efforts to reach out to OFWs through Facebook by actively responding to their concerns online and engaging with them through Facebook live. Mr. Danilo Flores, MIS Division Chief of OWWA, gave the participants a brief summary of OWWA digital transformation journey. He outlined several ICT reforms such as the creation of a Membership Registration Web Based Membership Processing System and case management system. He also cited that they started to synchronize and consolidate data with the POEA. One of the highlights of his presentation was the discussion on the OWWA mobile application. He said that member OFWs could apply for services and benefits online through the mobile app. To end his presentation, Mr. Danilo said that there are still rooms for improvement and continued efforts would be done to digitally transform OWWA. The next batch of speakers focused on the role of social media. Mr. Juancho Robles shared the digital strategy of his successful website pinas.com. In his discussion, he emphasized the importance of digital statistics and creating a digital roadmap in designing innovative services for OFWs and their families. He also said that an effort to know and understand the needs and wants of OFWs and their families was key to the success of his website. Ms. Gemma Comiso of PEBA also discussed their strategy in increasing and sustaining their presence in social media. She narrated how PEBA started out from Friendster and how it evolved into an established organization. According to Ms. Gemma, OFW volunteers from all over the globe are the main reasons why PEBA continues to become successful in its advocacy. Mr. Lito Soriano of LBS Recruitment Solutions Corporation was also invited to talk about the digital success of his company. He narrated that LBS has been exploring the adoption of ICT in the recruitment agency since 2004. He said that he took advantage of the emerging technology and used it to establish a technology driven manpower recruitment agency. According to Mr. Lito, the digital transformation of LBS required passion, determination and effort. A large part of their success was in investing in the right technology and people. LBS presence in social media is also one of their strengths. 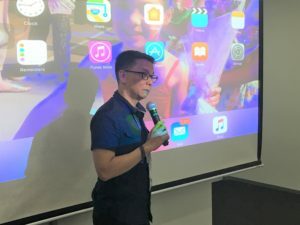 Engagement through Facebook remains to be the most effective tool to connect with OFWs and their families. Mr. Lito also mentioned that the government could establish partnerships with the private sector to share best practices and expertise. Mr. Carlo Ople, Vice President of PLDT Digital Strategy, presented trends, challenges and opportunities in digital transformation. According to him, digital is the new mainstream and the evolution of technology would continue to accelerate. It is because of this trend that companies should start taking advantage of it. 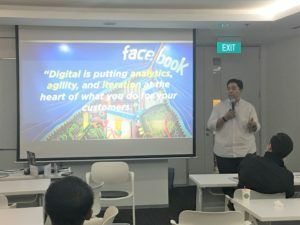 He emphasized that digital transformation is all about analytics or knowing and understanding your data, agility and iteration or to continue making mistakes, learning from those mistakes and getting better. Mr. Carlo discussed the concept of complimentary disruption in using technology to improve and produce new products and services. A company should first build on its strengths and know the pain points of their market. He reminded the audience that going digital is all about changing the way you work. It is also about breaking barriers and increasing coordination. To end his presentation, he told the participants to act now, continue making risks and get better. Mr. Ferdie Saputil, Public Sector Lead of Microsoft Philippines, wrapped up the Conference. He talked about the continuing efforts of Microsoft to bring technology closer to the people and to use it to improve the lives of Filipino people. Mr. Jerome Alcantara, Executive Director of the Blas F. Ople Center, provided the next steps for the Conference. According to him, the challenge now for the OFW sector is on catching up with the technological infrastructure and cultural mindset that digital transformation requires. 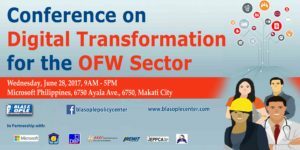 The success of digitally transforming the OFW sector also means that collaboration and coordination between and among stakeholders should be at the forefront of the initiative.